On 18th January 2012 Prime Minister Julia Gillard on behalf of the Multicultural Council of Australia acknowledged Lion Jenny Tew as a ‘People of Australia’ Ambassador. Jenny is one of 40 national ambassadors who have been recognised for their outstanding work in building strong and cohesive local communities. These local champions have been independently selected as the new People of Australia ambassadors following public nominations. In 1981 Jenny Siv Phan Tew moved to Australia with her mother and two siblings and in two months secured a job as a healthcare interpreter. She was 26 years old. The decision to come to Australia was made following her father’s death in Cambodia. Fortunately he had encouraged her to learn English and to embrace the best education he could provide. Life was very different, she said.” I came here in September and it was cold compared to Cambodia and the sky was cloudy. I somehow felt sad and lonely and I had no friends at the time. Jenny worked hard to change that by establishing two successful businesses and becoming an integral member of the Western Sydney multicultural community, helped by her fluency in six languages. 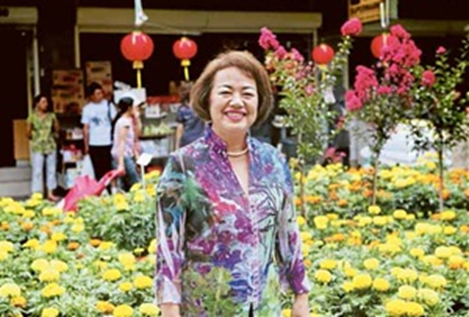 In 2006 Jenny was appointed to the role of President of the Cabramatta/Cabra-Vale Lions Club and in her time as President has hosted numerous charitable initiatives and fundraising events and has organised and formed two Leo Clubs for whom she has remained an advisor and mentor. Through her work, personal passion and ongoing commitment and support in promoting cultural diversity within Western Sydney and beyond, Jenny has been successful in integrating a harmonious enterprising and friendly atmosphere in the local community. The Government’s multicultural policy, The People of Australia, recognises the breadth of our diversity and builds on our strong commitment to Multiculturalism in Australia. As a new ‘People of Australia’ Ambassador Jenny and the other ambassadors now have a new platform to promote their good work and share their ideas and initiatives that can help inspire others. They will also be able to provide advice to government and the Australian Multicultural Council which will assist and strengthen the government’s multicultural policy. The 2012 ambassadors’ term commenced on January 18 and ends on 30 December 2012.